BIZ-Links is a great way to market your business and to develop a strong referral network. It’s like having an expanded sales force in your corner! Participation in the group is vital, and the group has attendance requirements to insure the integrity and strength of the group. Typical meetings begin with officers' reports, general announcements, and then each member has the opportunity to present a 60-second commercial about their business and what sort of leads they’re seeking. Each week, two group members prepare presentations on their companies for the group. Prospective members are allowed to attend up to two meetings. A nominal fee is charged for participation in the group that includes a full,hot breakfast each week. All networking group members must be members of GMA. 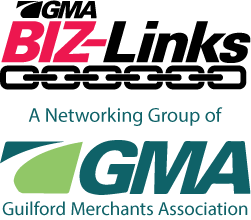 Please contact GMA if you would like more information on joining GMA and or the BIZ-Links networking group. We can’t wait for you to be a link in our BIZ-Links chain! Current Members Only: Click the button below to pay for your Biz-Links quarterly dues.